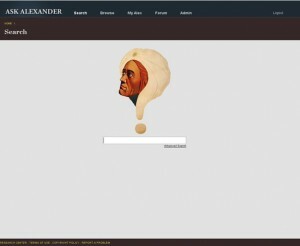 Those of you who have logged in to Alexander recently may have noticed the new look and some new features. We are calling it Ask Alexander 2.0, and, although we are still working on many neat ideas, it is coming along nicely. The first thing you will notice is the new design which was elegantly conceived and created by Dave Buck. Second, you will notice a number of improved functions with regard to the search. These include thumbnail pictures of the book covers next to the results, more results, and, this is the big one, a much faster search! Try it and see, even a search for “Houdini” or other big search term returns the results almost immediately. 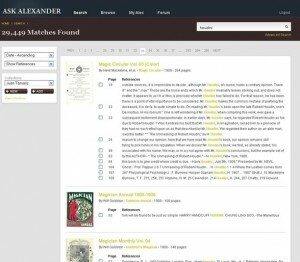 Third, we have expanded upon the collections idea with a page feature called “My Alex”. Here you can assemble a bookshelf of your favorite books and give them ratings so you can locate them instantly. Additionally, there is a button to repeat your last search or to look at all of your previous searches. Hopefully these new features will help you find some wonderful new knowledge and improve your magic! Thank you very much to Dan Buck, Dave Buck, and Dan Smith for all of their help in this and future iterations of Alexander. Also, if you have computer skills that may be of help to us, please consider volunteering as we could certainly use the help in making a great tool even better. Happy searching!